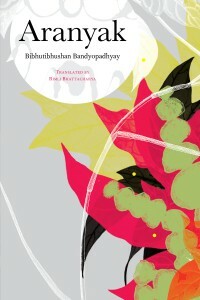 A classic of Bengali literature, available for the first time in English translation. Any readers interested in receiving future Asymptote Book Club titles can find out more here. If you’re already a subscriber, we’ll be leading a full discussion of Aranyak—including an exclusive interview with Rimli Bhattacharya—on our members-only Facebook page. We also invite readers to share their initial reactions to this month’s title on social media using the hashtag #AsymptoteBookClub. We’ll look forward to hearing from you! 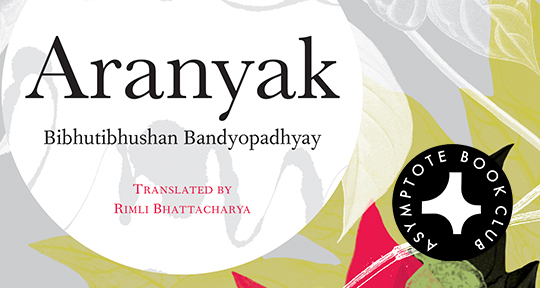 The novel Aranyak was composed at the end of the 1930s from Bibhutibhushan Bandyopadhyay’s diary, which accompanied him through his years spent in the northern Bihar region. The plot is simple: an urbane, educated man from Calcutta (Satyacharan) receives a distant post administering the settlement of uninhabited land. At first he hates it (“The idiots, the barbarians, natives of this region—were they capable of appreciating a fine thought?”), but he gradually succumbs to the sublime majesty of the forest. His resistance wins our trust. It would’ve been a bore if he went to the forest eager to sing its praises, but to witness the wild buffalo God Tarbaru through his disenchanted, modern eyes is akin to experiencing a miracle. It is also, however, a pleasure to see how nature can’t change him, how he remains a dandy. Late in the novel, when asked whether or not a necklace is fashionable in his home city, he thinks but declines to share: “I do not wear a necklace of hinglaj in Calcutta. No one in Calcutta would wear one.” The novel succeeds as an honest consideration of a simple premise (city-man goes to the woods) that realizes the fullness of both nature and culture. Satyacharan witnesses the sacred in nature through his monocle of culture: it is only through his lithe prose and his refined habits of observation that we glimpse the ineffable, which, he repeatedly concedes, escapes his ability to represent it after offering us a convincing, sweeping panorama. A less skeptical, sophisticated chronicler would’ve missed it. But he’s there to destroy the forest, so his sensitivity to its beauty has the tragic weight of an apology. These are the last impressions of a dying world, recorded lovingly by its murderer. Stay tuned for an exclusive interview with the amazing translator, Rimli Bhattacharya. Chris Power is a senior teacher of French and German at Fluent City, a project coordinator writing, translating, and editing subtitles and captions at the International Digital Centre, a masters student in the German School at Middlebury College (during the summer), and an assistant editor at Asymptote. The Asymptote Book Club: An Update!